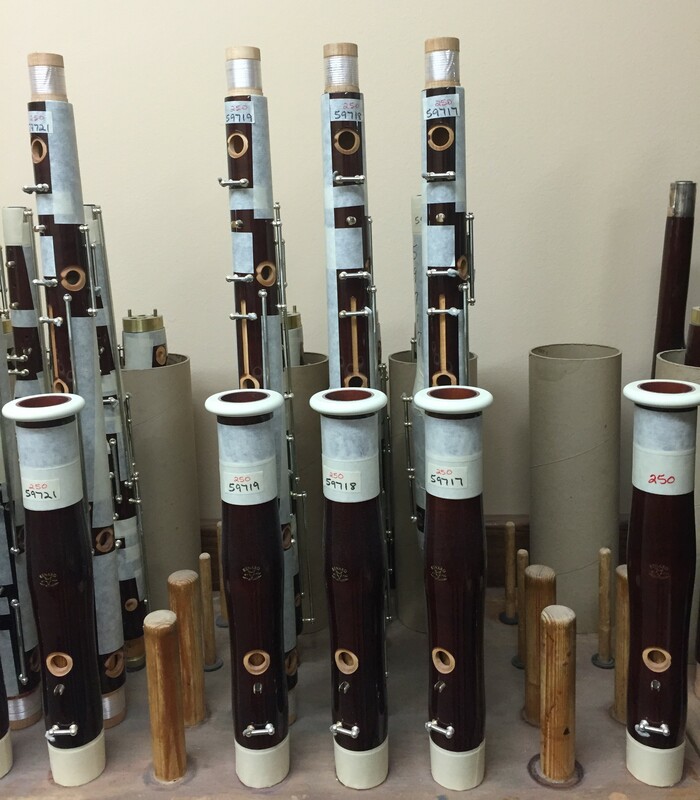 Fox Products Corporation in South Whitley, Indiana is the world headquarters for manufacturing bassoons, contrabassoons, oboes and English horns. The Breaking Winds Bassoon Quartet had the chance to take a tour and learn how bassoons were made! Mr. Fox was the principal bassoonist for the Chicago Symphony from 1922-1949. He wanted to create professional bassoons made in the U.S. After retiring, he spent 2 years making the first Fox bassoon in 1951. 1960’s: Hugo’s son, Alan, learns about instrument manufacturing. Alan Fox oversaw the development of bassoons, contrabassoons (1970), oboes (1974), and English horns (1999) for over 50 years. Alan was visiting the factory on the day of our tour, and we had the honor of meeting him! On our trip, we got to hang out with current owner, Tony Starkey! The mini museum welcomes you with an assortment of bassoons. Wood pieces waiting to be boot joints! Salivating over the beauty of these tenor joints. This machine drills tone holes. Overall a wonderful day at Fox Products. Thanks for having us! Check out our Instagram account for more pictures and adventures!